On 15th Feb 1867, Post Egypt issued its first ever independent definitive series with a set of six stamps which are known to be the first stamps in the world to feature a historical subject. The postal history of Egypt goes back to the Napoleonic period when the single line handstamps were issued. During the 1820s an Italian set up the first postal system in Egypt which continued for almost 3 decades. 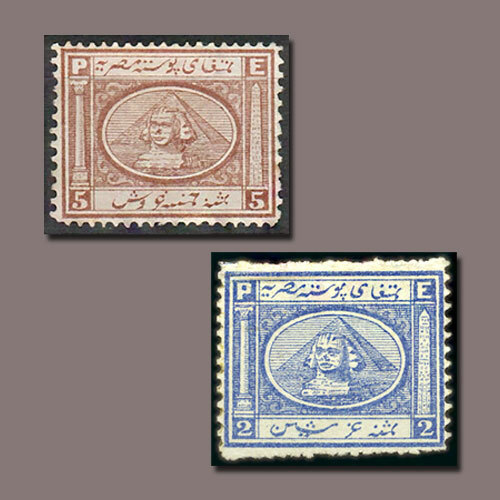 Further, in mid-1866 the Egyptian Government took control of this service and the first stamp was issued which was an overprint issue. Firs independent stamps came in the year 1867 when the Post Egypt issued its second stamps known as the Pyramid and Sphinx series. The stamp depicts a pyramid the most important monument of national importance with a sphinx in the centre. The stamps were issued in 6 different denominations between 5 Egyptian paras to 5 Egyptian piasters. Before that, no other country has ever issued a stamp with a historical subject as a theme, hence, making these stamps “World's First to Depict a Historical Subject”.